We have reduced the amount of packaged foods that we eat, but we do still have a few staples around our house. We have switched to organic brands and look for items that have no preservatives, artificial sweeteners or flavoring, and no trans fat. I thought I would share with you which ones we have found tasty. My husband likes to take this instead of chips in his lunch. I think they taste way better than cheezits or goldfish. 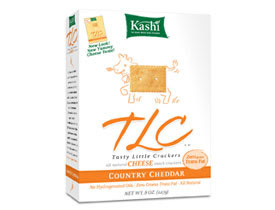 Country Cheddar is our favorite. It definitely satisfies a salty craving. 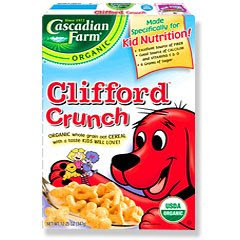 My daughter loves to eat cereal for breakfast and Clifford Crunch is usually her first choice. She might just like saying Clifford Crunch, but I don't feel guilty giving it to her. It only has 6 grams of sugar compared to 9 grams in Honey Nut Cheerios. In the book Superfoods Rx Diet the author recommends this cereal as a good choice for individuals who like cereal. This is by far my favorite snack. I will grab one for breakfast on the go or eat one as a midafternoon snack. The kids will only eat the Honey Graham flavor, but my favorite is Peanut Butter. Each bar contains between 120-140 calories depending on the flavor. They contain no hydrogenated oils, no high fructose corn syrup, no preservatives, and no artificial flavors or colors. They also are very filling. If you have any products that you have found that are yummy, please share.